LOS ANGELES — The art world is full of rivalries: the competition between Ghiberti and Brunelleschi for the Florence Baptistry doors, the lifelong creative sparring between Picasso and Matisse, and let’s not forget that time Robert Rauschenberg erased a de Kooning drawing. Add to this list Echo Park denizens Robin and Noodles. The artwork is colorful and fun and lights up at night with reactive LEDs. It will be installed in the neighborhood for everyone to enjoy until a velociraptor destroys it & will be documented in a book being released this fall forever (or as long as tangible matter lasts on this planet). 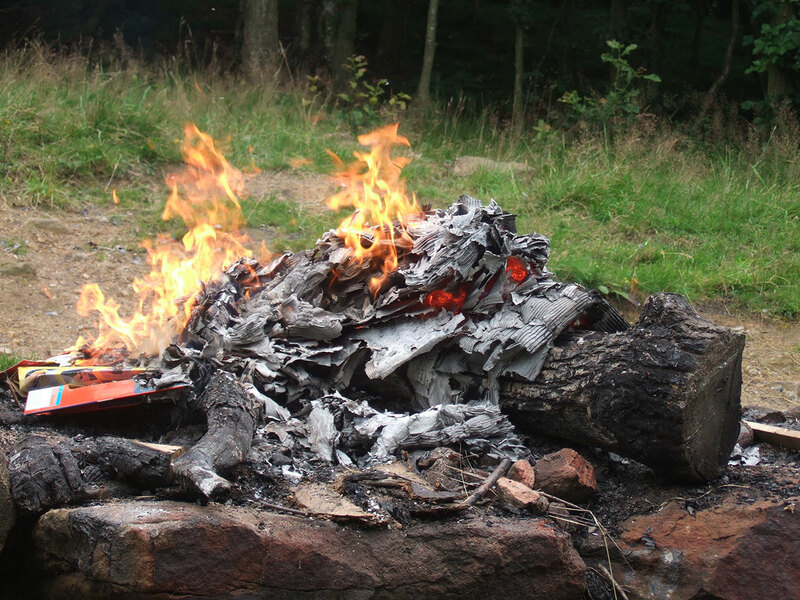 It will be burned outside my home in the neighborhood for everyone I invite to enjoy & take pictures to put on instagram which you can like forever (or as long as the memories and pictures last on this planet’s internet). WILL DESTROY YOUR ART. The LAist post left a lot of unanswered questions, however. Who is Robin? Who is Noodles? Is that his real name? Are they the same person? What does Robin’s art look like and why does Noodles want so badly to destroy it? 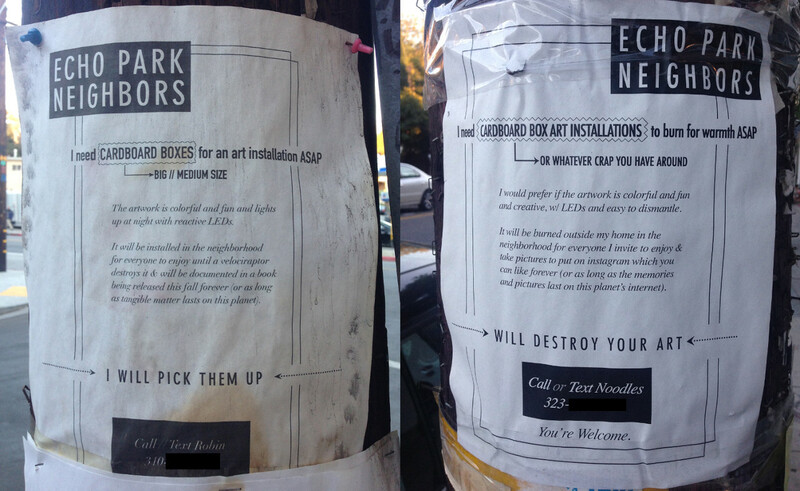 So, I set out to get to the bottom of the Great Echo Park Cardboard Box Art Feud of 2014. Since both Robin and Noodles listed phone numbers on the bottoms of their flyers, I decided to give them a call. I caught up with Robin as she was driving cross-country to Art Basel Miami Beach in a car full of donated cardboard. Robin Redd is an artist and graphic designer with a background in textile design. She originally posted the flyers in August for a piece she was working on as part of last summer’s Echo Park Rising music and art festival. “It was amazing, I can’t believe the beautiful people that I got to meet, who wanted to help,” she says of the response she got. 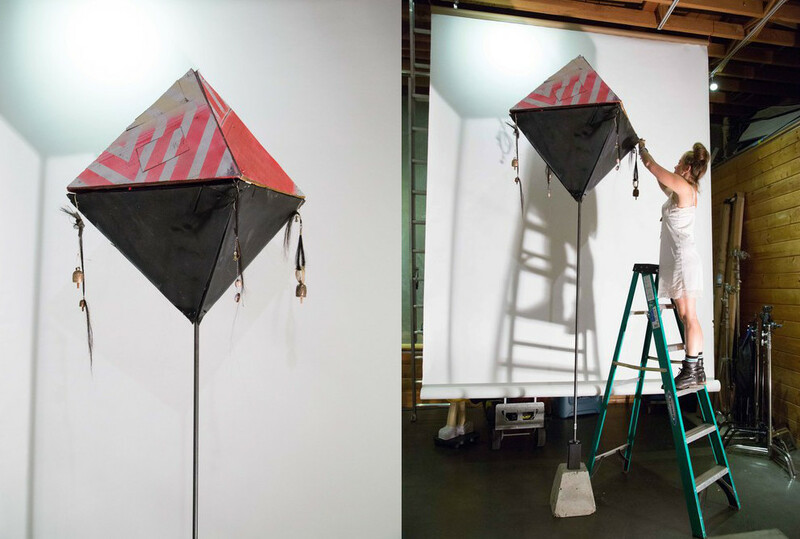 The work she ended up creating, “Air14,” has two pyramidal forms stacked back to back on the end of a long pole, resembling a DIY lightpole with fishing lures hanging off of it. The version she completed for the festival ended up not being reactive, but it will be documented in a forthcoming book, The Art of Cardboard, due out next summer. So who is Noodles? “I’m not Noodles. Noodles is just a name I threw on there,’cause I happened to be with my buddy Cheese when I came up with the idea. My name’s Derka,” I was told when I called the number on the bottom of the infamous Noodles/Derka’s flyer. I asked him if he was a rival artist. “Well, I cook, but I’m not a chef,” he said by way of explanation. “I just saw the flyer, I don’t know who Robin is. I like art, so I guess it’s cool, but it seemed like there was too much fun involved and she thought was going to be providing a lot of fun to the neighborhood, just by taking people’s cardboard boxes, so I thought this deserves something in response.” He had not seen “Air14” and obviously did not end up burning it in front of his home. Derka explained that he is a filmmaker who lives in Echo Park and said he’s part of a collective called the Bureau Society. 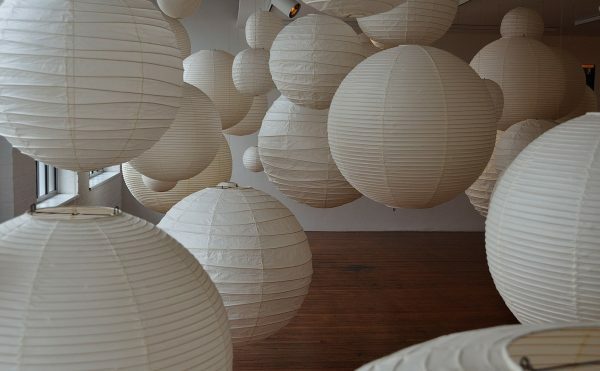 “It’s a collection of groups that all have different purposes. We’re interested in culture jamming and we do a lot of different things in a lot of different mediums, sometimes performance-based. This I would label under my project that I’m calling the bureau of fun reduction. She was having too much fun and we decided to take her down a peg. We’re fervently anti-fun.” His contrarian attitude is clear, but I’m not sure how mocking a lone street artist qualifies as culture jamming, which often appropriates the forms of mass media to attack mainstream corporate institutions. Ironically, this sounds exactly like what Robin is striving to do with her cardboard street art project, to engage the community through public spectacle, albeit in a less inflammatory way. It remains to be seen if the feud will continue after Robin returns from Miami, but she seems much more concerned with making work that people respond to, even negatively, than bickering on lampposts.